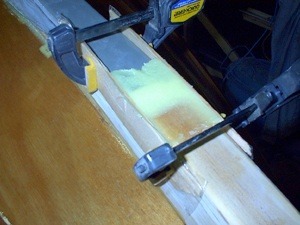 With the deadwood glued into position, the forward joint can be faired into the outer stem. 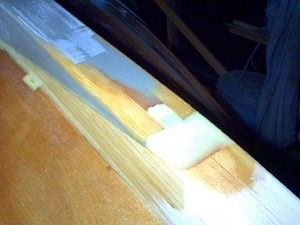 Here two wide battens, covered with packing tape, are clamped in place while a thickened mixture of epoxy/406 is formed slightly oversized. We then formed a large fillet along the entire length of the garboard-deadwood joint. This fillet ended at the garboard stem and stern intersections. 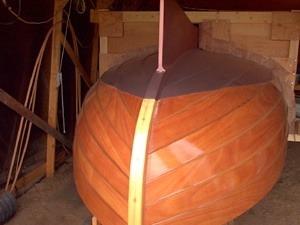 From there the stem and stern will be filleted to the hull with a small colour matched fillet. 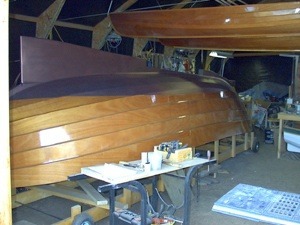 At this point the hull has received two more coats of resin to fill the glass cloth. Wee Rob waits above until its next adventure. Well, it may not look like much of a difference from the last picture to this one but much work has been done this week. 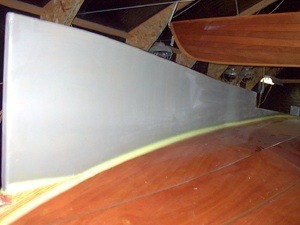 The entire hull has been sanded �smooth and recoated with two coats of resin. Then it was sanded yet again followed by a third coat of resin. Several waterline points were then marked as per Oughtred's boat building manual and the actual line drawn with a long batten passing through the previously marked points. Finally a few coats of resin with aluminum additive was rolled on below the waterline to ensure the boat is even less likely to absorb water. 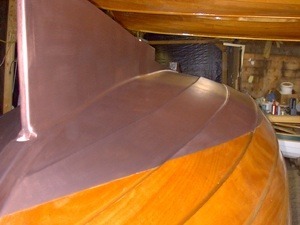 This kind of bottom makes the hull extremely abrasion resistant and� should provide an excellent base for anti-fouling later. At this time we are thinking of leaving the topsides bright. After sanding for several more days nonstop, I finally arrived at the point where the surface was overall quite good, with the reality being that any further effort would only bring small gains anyway. So finally, on went two coats of VC17m from Interlux. I know it doesn't need anti-fouling now but we had to put something over the barrier coats and it'll never be as easy as now with the hull upside down. Besides, adding coats with this system is a breeze, just wash with water and repaint. The handy wheeled table in the foreground was a barbeque cart in a previous life. This shot gives a better view of the new bottom. 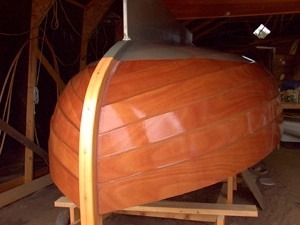 The fillet along the deadwood-hull joint can be seen here. The VC17m is amazing stuff to work with. It's so thin it feels like a stain going on but dries to a thin hard and slippery teflon finish. No more resting tools on this hull, they just slide off! So now, on to the next phase. That is, how do we turn this thing over? We considered all sorts of ideas, and all were too complicated or required too much manpower, which we don't have much of this summer. So I came up with this "cradle" arrangement with the idea being to roll her over onto her side and then over again to complete her 180 degree journey.